This is a strange little tool: an interactive index to middle east unrest. Move the sliders to ascribe different weightings to the various indicators that may influence instability (since the values shown are rounded, they may not always add up to exactly 100). Lock individual sliders by clicking the checkboxes. Roll over the chart to see indicators for each country. Seeing how this was originally made about 8 months ago, it is most interesting in retrospect. 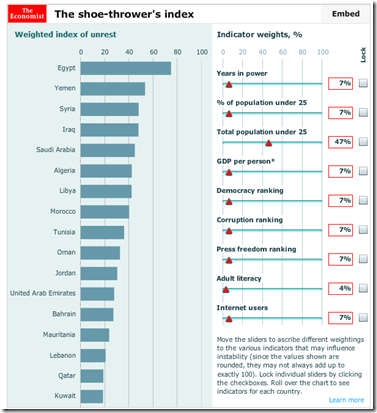 At the start they rightly put Libya, Syria, Yemen and Egypt at the top, but somehow Oman is higher than Bahrain?